O Poderuccio oferece uma variedade de acomodações para um total de oito camas, a fim de atender a qualquer tipo de exigência. Os nossos quartos podem acomodar famílias, casais que querem passar um fim de semana romântico; Além disso, eles estão equipados com todas as comodidades. Lá fora, você pode apreciar a beleza da natureza com um terraço com gazebo, mesas e cadeiras. Há também de aves de capoeira a que você pode dar comida. Adjacente fazenda é minha fazenda que produz, além de vinho, azeite e cereais, legumes e frutas da estação servido aos convidados. Este pequeno paraíso espera por você, você não vai esquecer facilmente. Fijne omgeving, vriendelijke eigenaren, we wilden de zat. langer blijven omdat het vliegtuig pas in de avond ging en we konden tot drie uur in het app. zonder bijbetalen. Ik kan het iedereen van harte aanbevelen. Diese Ferienwohnung ist schön und sauber. Sie hat eine tolle Lage. Auf der Terrasse genießt man die herrliche Landschaft. Die Besitzerin Lucia ist sehr hilfsbereit und liebevoll. Auch ihre Mutter ist sehr freundlich und grozügig. Bei Ihnen kann man sehr gute selbstgemachten Olivenöl und Wein kaufen. Wir haben auch echte Bioeieier und -tomaten für günstigen Preis bekommen. Die Gastgeberin hat uns frische Feige geschenkt. Zum ersten Mal haben wir so gute Feige dierekt vom Baum gegessen. Nur die ca. 5 Kilometer lange Straße von der nähsten Stadt dorthin ist steinig und etwas schwer zu fahren. Vielleicht ist es gerade deswegen dort ruhig und kaum Tourist zu sehen. Die Luft ist sehr frisch. Am Morgen und Abend sieht man ab und zu Reh u d Wildschwein. Sonst ist der energievolle schwarze Kater ein treuer Begleiter da. Wir haben einen unvergesslichen Urlaub gemacht. Es ist sehr empfehlenswert. Is this heaven? No, it’s Poderuccio. The photos don’t do it justice. This is a breathtaking setting, with abandoned castles on nearby peaks and verdant, rural scenery in all directions. As you’ll see in other reviews, it’s a few kilometers down a rural dirt road from downtown (and past some other agriturismos; keep bearing left until you start to descend the hill). The full-size apartment refrigerator includes a few “minibar” beverages for sale, but the Co-op supermarket in town is handily located for all your shopping needs. (We brought instant coffee, and used the supplied hot water kettle, to supplement the several kinds of tea provided on site.) Lucia has posted several recommendations for restaurants, and local places to explore, inside each apartment. Day trips to the many hill towns and other sights in the region are easily accomplished. But take some time to enjoy the vistas, absorb the Tuscan sunlight, and relax on the spacious patio. Our five nights here were easily the highlight of our trip to Italy. Enjoy! A hidden gem in Tuscany! The farmhouse is like something out of a storybook. The beauty of the Tuscan hills when you step through the doorway in the morning is breathtakingly beautiful. I highly recommend this property to everyone. Lucia, the property owner, and Fabiana, the landlady who lives on property, are both so kind and were helpful throughout our stay. -Lucia is very responsive with inquiries and questions. -We arrived after 8pm and Fabiana welcomed us with a smile and hugs! -The farmhouse was well equipped with cookware, dishes, and all the spices you’d need for a lovely meal in. -Lucia’s family makes their own olive oil and wine and they’re kind enough to leave a small batch for you to try. Absolutely delicious! And we even got fresh eggs too! -The bed was very comfortable and the linens were clean. Lucia even made sure we had fresh towels halfway through our stay. -Bathroom was well stocked with toilet paper, soap, hairdryer, and the shower offered plenty of hot water for back to back showers. 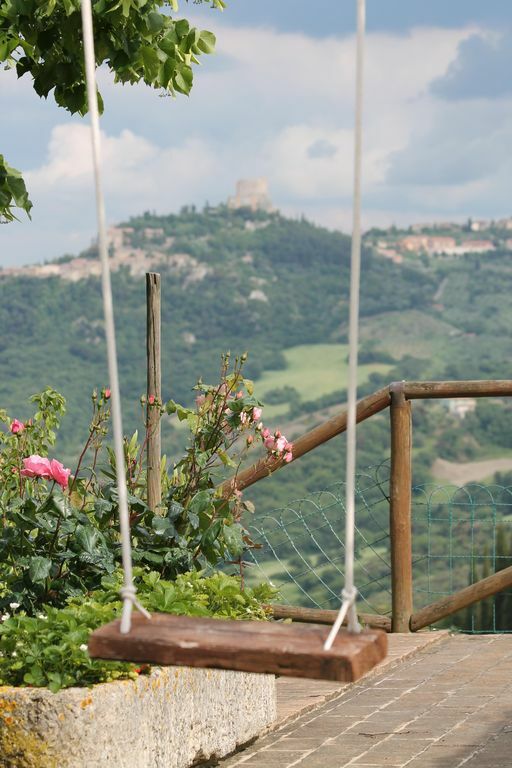 Overall, this property is everything you could want and more for a stay in Tuscany. I cannot wait to return and experience it all again! We loved the apartment, although it is a bit of a trek from town on a bumpy gravel road. A washing machine was available for use but you had to dry the clothes on a clothesline. The weather was absolutely perfect for our trip (rained only one evening). It was so nice to sit out on the patio and enjoy the absolutely wonder view across the valley. The olive tree orchards, the vineyards....all were so beautiful. Everything was clean and if you needed anything, they were helpful in getting what you needed. We asked about a restaurant one evening and she called and made us a reservation. We used this apartment as home base to travel around Tuscany to the various villages. It was a great location. Quiet and peaceful and 5 km down an easy gravel road out of town. Apt. was spacious and comfortable and language was no issue: we are proficient in sign language! We were there early Sept. It could be very hot during the summer. Casale em 1619, no campo, com vistas deslumbrantes e é excelente ponto de partida para chegar a todas as mais belas estâncias de Val d'Orcia. A 5 km é San Quirico d'Orcia, agradável para visitar, mas também cheio de serviços (bares, restaurantes, supermercado, tabaco, vários aluguéis, transportes públicos, etc.). Também a poucos quilómetros da cidade de Montalcino, Pienza e Montepulciano, Cortona e da bela Siena, ou aproveitar a cura águas termais de Bagno Vignoni, Bagni San Filippo ou spa sensorial de Chianciano Terme. Também é fácil chegar Mount Amiata onde a esquiar ou a pé. A empresa, dada a proximidade com a corrente Cassia SR e da antiga Via Francigena, é um ponto de partida ideal para caminhadas, mountain bike e passeios a cavalo ao longo de caminhos marcados e indicando o comprimento do passeio, os pontos turísticos e do grau dificuldade.